Norkan, Home of the Epoxy Superstore Contractor Center, is one of the Midwest's Largest distributors of International Paints and Devoe Coatings. Stop by and pick up these products from one of our several warehouses in Michigan or we can tint and ship many of these products. For more information, or if you're looking for something that you can't find, please call us at 1-800-227-8479. We have tint bases available for this product. Call for available Color options. High Build Solventborne Epoxy Coating - This is an industrial grade epoxy used for a longer lasting more durable floor or high performance coating. 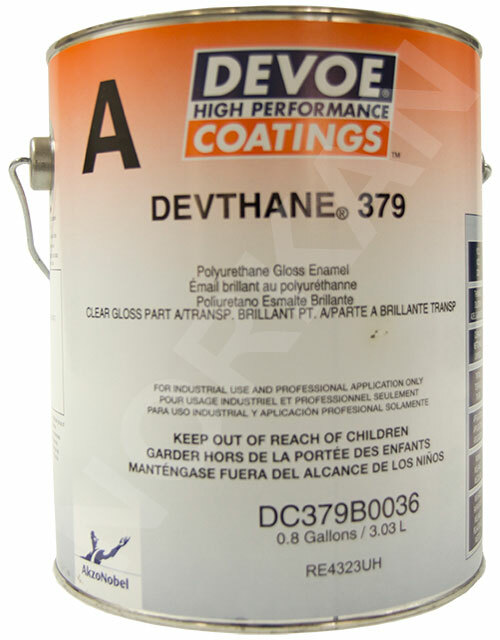 It has a higher solids count that most solvent based epoxies and a long potlife for ease of installation. This 2-gallon kit will cover up to 400 sq/ft. It consists of 1 gallon of Part A (pigment) and 1 gallon of Part B (hardener). It is extremely thick but easy to work with. The 224V Epoxy is solvent based, therefore should not be used in confined spaces. The solvent count is low so the odor/fumes aren't too volatle, but good ventilation is highly recommended. 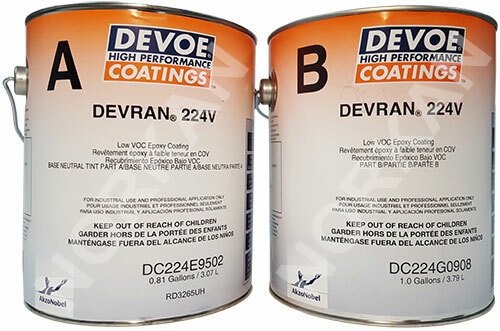 224V is a surface tolerant, two-component chemically-cured epoxy semi-gloss coating for industrial or high performance architectural coating (HIPAC) applications. 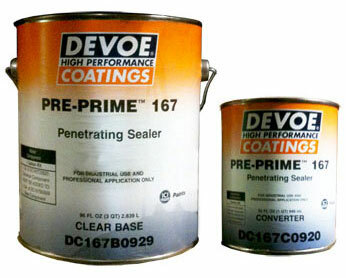 For use on properly prepared steel or masonry surfaces: Use as a filler for concrete block. Typical Uses: warehouse floors, garage floors, industrial environments, floors and equipment in chemical, fertilizer, power plants, petroleum refineries, pulp and paper mills, water and sewage treatment plants and mining operations. Can also be used in the hard service areas of correctional facilities, schools, commercial and restaurant kitchens were a high performance architectural coating (HIPAC) is required. Special Qualifications: Federal Specifications TT-C-550, TT-C-535B, MIL-C-22750F, and MIL-P-23377F Type I. Colors Available: Original Color Chips Standard Colors: Beige, Taupe, Wheat, Tile Red, Light Gray, Medium Gray, Charcoal, Black, White, Green, Steel Blue, Royal Blue or contact us regarding special order Custom Colors. Weight/Gallon: 12.5 lbs./gal. (1.5 kg/L) – varies with color. VOC (EPA 24): 1.8 lbs./gal. (212 g/L) – varies with color. For maximum adhesion and longevity; thin out your first coat of epoxy with Xylol Xylene (16 oz per 2-gal), this coat will serve as a primercoat and allow the epoxy to soak deep into the concrete. Then apply your second coat of epoxy without thinning it for a uniform sheen and coverage). Even if you are doing a single coat, Due to the thickness of this product we recommend thinning it out with Xylol Xylene . This allows for much easier workability and allows the material to stretch further. Limitations of Use: Not recommended for use without a topcoat. Do not puddle on horizontal surfaces.